We’ve recently bid farewell to our remarkable summer intern class of 2013. As our now-former interns head back to campus with new skills and a stronger knowledge of the web industry, we’re looking back at the process that brought them to Viget in the first place. Like last year, we know that data is key to understanding and improving recruitment. 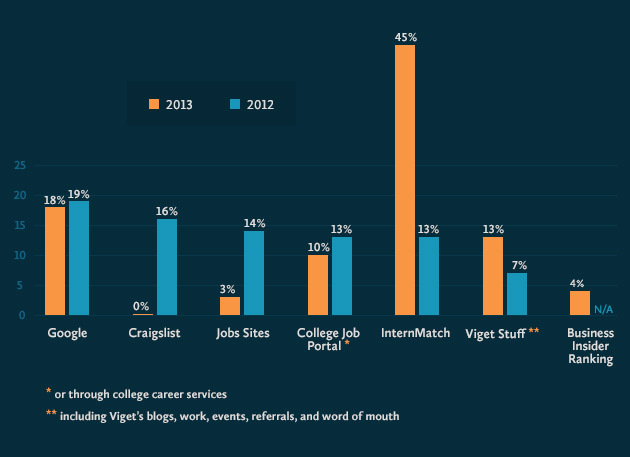 Last year marked the first time that Viget systematically collected recruiting data. We did it again this year which means that we’re now able to draw some comparisons. Below are some of the useful, new insights we’ve gained. * Infographic design by Steve Schoeffel. How many internship applicants did Viget receive? This year, one of our explicit goals was to make our evaluation process more efficient so that we could keep applicants more accurately informed about our timeline for possible offers. In order to do that, we set a defined and much briefer application period of January 1st through February 15th -- a major change from last year’s roughly four-month evaluation period for which we set no strict deadline at the outset. Despite the dramatically reduced application window, we saw our application volume more than double. The size of our final internship roster also nearly doubled. But, both years, the main takeaway is the same: Viget is highly selective when it comes to internship recruitment. That's because one purpose of the internship program (among many) is to serve as a full-time recruiting tool. We know not every intern will be a full-time hire, but, when we evaluate applicants, we look for a level of past performance that indicates strong potential for joining Viget long-term. 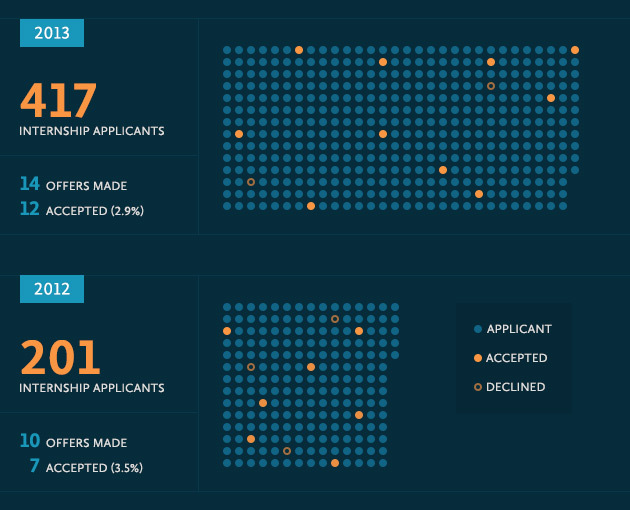 Which labs received the most applicants? Another major change this year: we introduced two new internships -- a Project Management internship and a Business Development internship. Moreover, there was significant overlap among applicants for the Marketing, PM, and BizDev internships; roughly 10% of the PM and Marketing applicants overlapped with each other, and 20% - 30% of the BizDev applicants also applied to PM, Marketing, or both. The overlap makes some sense. These roles are business- and analysis-oriented without necessarily requiring either programming skills (as do the DEV and FED roles) or visually creative skills (like DES and UX). Understandably, students majoring in Business, Marketing, and Communications tended to apply for Marketing, PM, and BizDev -- or some combination thereof, speculating that they could be equally qualified for any of the three. We also see that, while there was some fluctuation between this year and last year in the number of applicants for our “maker” labs -- DEV, FED, DES, and UX -- the overall increase in volume occurred for the Marketing, PM, and Sales roles. It seems possible that introducing the two new internships brought us more applicants for Marketing than we may have otherwise seen. How did applicants find out about us? This year, we saw a significant increase in the percentage of students who heard of us through InternMatch. That’s not surprising. For a few years now, InternMatch has been steadily growing in its reputation among students as a great resource for finding internships. Additionally, unlike last year -- and thanks to a winning tweet in an intern advice competition -- Viget displayed a company profile on InternMatch, along with a job posting for each of our internship openings. 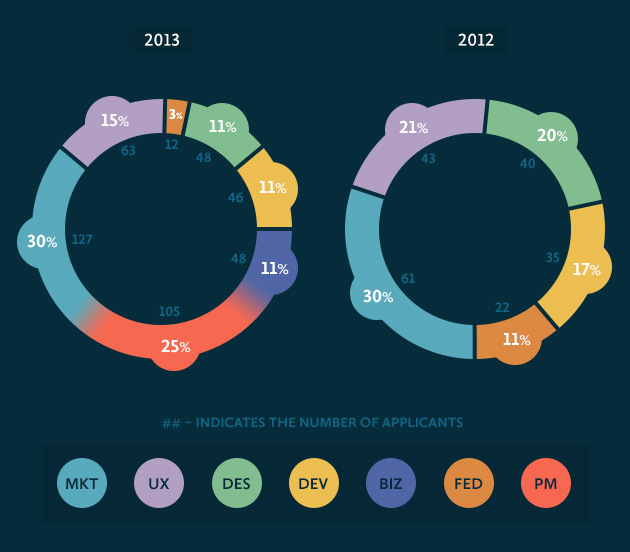 Moreover, 77% of applicants sourced from InternMatch applied to Marketing, BizDev, and PM (this figure accounts for the overlap in those areas). Not only did our new presence on InternMatch contribute significantly to this year’s increased volume overall, but it also brought us most of our Marketing, BizDev, and PM applicants. This is helpful to know as we refine each of those internship roles in the future and possibly add new roles. For our “maker” roles, Internmatch isn’t the most valuable source, but for Marketing, BizDev, PM, and the like, it certainly seems valuable. All that said, with recruiting -- as with most things at Viget -- we value quality over quantity. It’s interesting to note the greater numbers of applicants. But what we’re really looking for are those few, exceptionally talented students who show promise for making an impact on Viget and on our industry. How, then, did applicants who got offers find out about us? Like last year, our strongest applicants found out about us through some combination of their own online internship searches, various resources offered by their college career services, and "Viget Stuff" -- our blogs, events that we host or where our staff give presentations, referrals from full-time staff or former interns, and good, old-fashioned "word of mouth" triggered within students' academic, professional, and personal circles by these wide-ranging activities. What’s the lesson, if any, for Viget? The truth is that there’s no single trick to successful applicant sourcing. It requires a combination of posting to the right sites, getting in touch with the best professors, staying in touch with former interns, and, most importantly, producing an internship program that, through its work and culture, makes its own best case for itself. By that token, it’s worth noting that many of the students in this year's "Viget Stuff" category cited “word of mouth” as the way they found out about us. That’s encouraging. I’m optimistic that, with year two of our annual internship program behind us, it’s becoming one that great professors and talented students spread the word about, organically, within their own communities. Interested in Learning a Little Viget Trivia?